Artificial lures come in an endless array. But the techniques for fishing with them are typically similar. Keep in mind that artificial fishing lures are designed to simulate baitfish. Therefore the way of fishing with them should be the same. Here are some methods you should consider. This is a modified form of trolling or drift fishing and is an effective method to attract fish and make them to strike or start feeding. Using natural baits or buck tail jigs, bottom bouncing is often done from a moving boat (drifting or with a trolling motor) by dragging the lure or bait along the bottom, making it bounce over the raising puffs of mud or sand. This is one of the most active fishing techniques, needing you to pop or snap the rod tip fast to move the lure vertically in the water column. You can either jig straight up and down or cast your lure out and jig them back towards you horizontally while reeling. This simulates an injured baitfish that a game fish would like to bite. Jig rigs are available in all sizes, colors and shapes and can be used with or without live fishing bait. Trolling is a fishing technique where one or more fishing lines with bait fish or lures are drawn through water. This may be on the back of a moving boat. 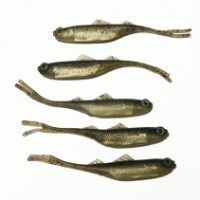 The moving boat imparts action to the lures, whether they are surface lures, spoons lures, swimbait, spinnerbait or plugs. Trolling with ultimate fishing lures is one of the most popular fishing techniques for catching big games like marlin and tuna. The depth at which the lure is placed depends on its weight, the type and diameter of fishing line being used, how much line has been let out and your speed. This fishing method can cover a large area of water quickly because the motion is typically horizontal. The angle at which the rod is held, the speed of reeling to retrieve the lure and the design of the lure all influence the depth of the lure. Fishing spoons have an oblong shape and a simple design. They are concave on one side that holds water creating a wobble and light reflection simulating a crippled or fleeing bait fish. Spoons work best for bigger fish species like largemouth bass, northern pike, trout, muskies, salmon and walleye. Learning these techniques will help you make the most of your lures and you’ll enjoy your lure fishing a lot.